It is the deep south of Brazil that offers the best surf in the country, with bigger andmore consistent swells than the north. While Paran? and Rio Grande do Sul States have good potential, Santa Catarina Island is definitely where the best surf in Brazil can be found. These three states provide the surfers with around 300km of surfable coast. Fun beachbreaks make part of most of the coastline with some pointbreaks that turn on on the big S swells Santa Catarina island is a great destination with a concentration of 20 breaks, covering swells from all directions, further south are the quality spots of Garopaba and Torres(Rio Grande do Sul). Swells are reasonably powerful and frequent, especially from April to October, this source of S-SE swells provides 2-10ft waves with occasional 12ft conditions at the big wave spots like Praia da Vila. Unlike many surf destinations it seems that spring is better than autumn with many more E swells. Tidal variation is minimal and has little effect on most spots. Most nationalities need a visa. Aerolineas Argentinas and Qantas provide weekly flights to South America. The flight is pretty long!!!! It takes around 20 hours. You can easily rent a car for around $150/week. Be careful whilst driving along the Highway BR-101, it has a terrible reputation in the country regarding car crashes. Drive carefully and you will be alright. In the Summer many people descend to this area from all big national cities, as well as plenty of Hermanos Argentinians from across the border. Accomodation can be found with no problems and the prices ain?t too high. enough for you to stay overnight. The climate is wet/subtropical. Similar with Sydney in some ways. n be surprisingly cold. The water remains stable all year round, but a steamer is definitely required for the winter. This is a cosmopolitan region but with a quiet, rural vibe based around the small fishing villages. Parties are a MUST in this part of Brazil. You will probably see lots of beautiful women in the nightlife as well as during the daylight at the beach. Although crowds aren't that bad, you are in Brazil and all brazilians just love to go surfing. Respect and you will be respected!!! Be alert, a couple of thiefs around the area. Keep your eyes on your stuff when going for a surf and other times as well. Along the Brazil's South Coast there is a couple of secret spots that can be found, where perfect and empty waves break consitently all year round. 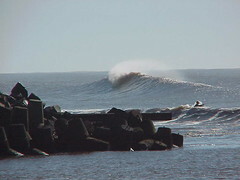 At Torres(Rio Grande do Sul), a outer reef turns on the big E-SE swells, it is a tricky wave, experience is required. Only reached by jet skis. Florianpolis has around 20 quality surf spots, Among them, Lagoinha do Leste turns to be the less likely to attract surfers due its stepy hills and long bush tracks. To get at the beach, a 45min hike stands in front of you. The waves are world class. It is a swell magnet, even when the rest of the island is flat, you will find good 2-3ft beachies in the place. No accomodation.